Our removals company in London offers man and van services for those moves when a traditional removal service is not needed and the single-item deliveries and collection service is also not suitable. For instance, the client might be a student who does not have a great deal to pack and move but is relocating to new accommodation. Our reliable man and van services are ideal for those who have a number of items to move and their car is too small, they don’t have a car or they don’t have enough goods to move to justify a large van or truck and a full removals team. As with larger loads and the single-item service we can also link the man and van service to our storage service if that is what the client requires. 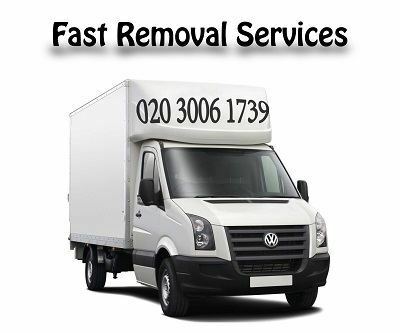 Fast Removal Services has a large vehicle fleet and we will select the most suitable size van for each job. It will be driven by a reliable, professional and very experienced staff member who knows the area(s) involved. Our van drivers can be booked to pack your goods, load them into the van, transport them to the destination, offload the van and even unpack for you. This service is available after hours and over weekends so we can accommodate our client’s specific and unique needs and schedules. Our competitive rates are just as flexible so that we can fit in with most budgets! Contact us via our website or on 020 8884 9141 for a no-obligation quote for our tried and tested man and van service. Our staff members will be more than happy to answer any questions you may have!